The holiday season came into full-swing on Huguenot Street last weekend. For the first time, the Reformed Church of New Paltz and Historic Huguenot Street (HHS) collaborated their respective events to provide two days of joyous fun and giving for “A Holiday on Huguenot Street” on Friday, Dec. 2 and Saturday, Dec. 3. Gaffken noted that many community members were involved in making the weekend’s festivities possible, especially Executive Director of New Paltz Chamber of Commerce Kathy Prizzia and event coordinator at Reformed Church of New Paltz, Kate Weston. There seemed to be something fun to do for everyone between the two days. HHS held holiday tours, horse-drawn carriage rides and a miniature donkey petting zoo. Meanwhile, local Girl Scouts held a cookie walk and sold their homemade treats outside of the church, donating all the money to food pantries through the organization Local At Heart. The church sold handmade wreaths and ornaments at their annual Holiday Craft Fair, held “Soup on the Stoop” and collected donations for Walden Humane Society. They also held a puppet show by the SUNY New Paltz Fine Arts & Theatre Department and a performance by Big Blue Big Band. 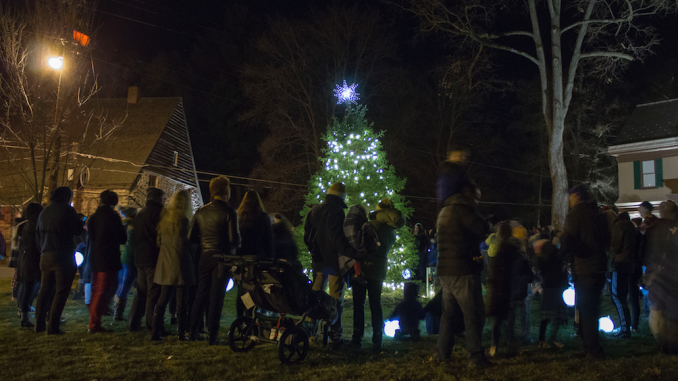 However, the main event was the third annual community Christmas tree lighting on Friday, which for the first time included a paper lantern parade. Between 6 p.m. and 7 p.m., residents, community members and SUNY New Paltz students gathered in front of the church, located right next door to HHS, for “Soup on the Stoop.” People stood around, holding their soup and paper lanterns in the cold of the night, enjoying the Christmas carolers singing from atop the church’s front steps. Volunteers from SUNY New Paltz, representing various a cappella and theater groups, then sang for the crowd on the street. The likes of “Rudolph the Red-Nosed Reindeer” and “Jingle Bells” put smiles on people’s faces enjoying the jolly time. By 7 p.m., everyone walked down the road lined with luminaries to the Deyo House, the site of the community Christmas tree. Mayor Tim Rogers and County Executive Mike Hein spoke about the significance of HHS and the importance of the community gathering. They then counted down to the anticipated tree lighting. Many students gathered to take photos in front of the tree and families lined up for photos with Mr. and Mrs. Claus, while SUNY student-performers sang a few more Christmas classics beside the tree. “It was fun to walk over with everybody and just to see all the families with their little kids singing along is really nice,” said Faith Gillen, fourth-year psychology major and president of Absolut A Cappella, who participated in the event. She said this was the first time SUNY students sang at the tree lighting, and she hopes the tradition continues in years to come.